Core to any institution's growth is solid planning. 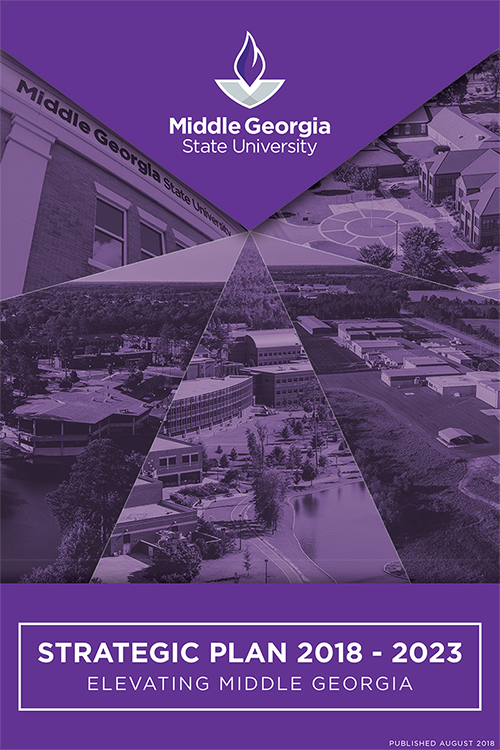 At Middle Georgia State University, we pride ourselves on using input from local and regional leaders, the businesses who will be employing our graduates, and – of course – our faculty, staff, and students in the creation of our strategic plans. Below, you will find details about MGA's strategic planning efforts, constantly updated as our plans grow and change with the needs of our students and our communities. Click on the above image to open the 2015-2018 Strategic Plan in your browser. 4% (only 2 action items) were found to be not feasible at this time after further analysis. 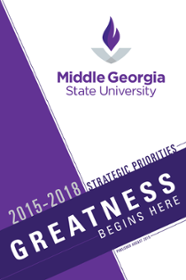 To see MGA's progress on the 2015-18 “Greatness Begins Here” plan, click on the image to the above. In this document, you'll find the original Strategic Plan, marked with icons reflecting the status of each strategic initiative for Year 1 (2015-16). A green checkmark means an initiative is complete, a yellow arrow indicates the initiative is in progress, an arrow and a check means we completed an important first step on the initiative last year, and a red “x” means an initiative is not feasible at this time. The number in parenthesis following each item refers to the Year 2 (2016-17) initiative that will build upon our progress as we move forward together. Look at the video above to see examples of how far we have already come!